Listen to "Witchbane" on your iOS and Android device. Seth Tanner and his brother Jesse's fun evening debunking local urban legends ends with Jesse's gruesome murder. Seth vows revenge on Jesse's killer-too bad the murderer has been dead for a hundred years. Seth uncovers a cycle of ritual killings that feed the power of a dark warlock's immortal witch-disciples, and he's hell bent on stopping Jackson Malone from becoming the next victim. He's used to risking his neck. He never intended to risk his heart. Thank you for the audio Arc. I voluntarily give this book an honest review. Seth had gone with his brother for a little fun ghost hunting night, until it was more sinister then either dared dream. When a coven of witches are trying to kill the first born son every twelve years. Seth treks down the next victim location. Meeting sunny the hottie bar tender was just a plus. Once Seth finds out who sunny is can he keep him safe?This was such a great audio I just loved how kale Williams brought the Seth and Evan alive. 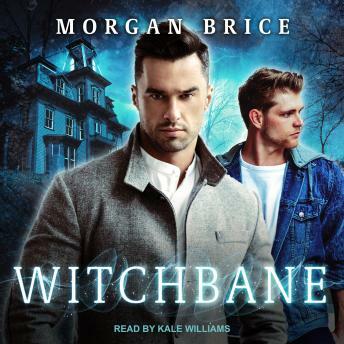 Witchbane by Morgan Brice is the first book in The Witchband Series. It is an Urban fantasy that includes paranormal aspects, thrilling scenes and lots of steam. The story immediately caught my interest and kept it entirely until the end. I love Seth and Evan and enjoyed their interactions. I definitely am looking forward to more of this series. Narrator for the audiobook is Kale Williams, who does a fantastic job. Smooth voice that is very easy listening to. Very good! I received an advanced reader's copy of the book and I am voluntarily leaving my honest review and recommendation.